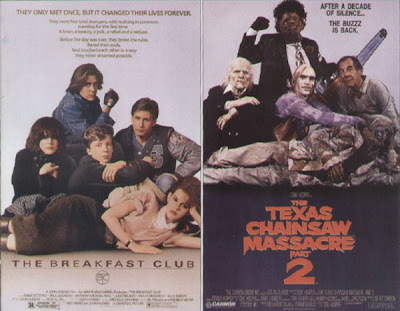 This month's Giant Magazine points out the similarities between the posters for The Breakfast Club and Texas Chainsaw Massacre 2. I never made the connection before and it's pretty damn funny. I have seen both movies many many times,yet have failed to notice.Ah well.Connection:My acting teacher knows the old man that Dennis Hopper bought the two chainsaws from in the movie.Hah.Not that its all special or whatever,but I thought it was funny. I always loved that cover. I never realized that they were aping Breakfast Club (another great movie if only for the Judd Nelson fist-jutting at the end). The corpse as Molly Ringwald is pure poetry. That is ingenius on so many levels. I hope whomever came up with that idea gets some credit. I wonder why it took us all so many years to pick up on that?